Spynga: What did you learn that surprised you when creating Province Apothecary skincare? Julie: I learned so much, and I am still constantly learning! I have been studying herbal medicine for the last 2 years and I love learning about plants and from the plants. I have learned how to work in a team. 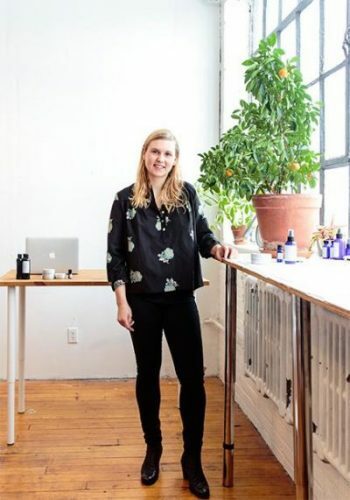 I started the company on my own and now we have a team of 15 people and it’s been such an amazing learning experience growing PA.
Spynga: What’s the best wellness tip you’ve learned since starting Province Apothecary? Julie: Take time for yourself. The emails and to-do list are never ending, but you’re no help to anyone if you are over worked and exhausted. Spynga: Why is it important for our skincare to be organic? Julie: I believe in whole plant medicine, internally and externally. We made the most effective products with the highest quality ingredients and those happen to be organic and grown/harvested with love and amazing intentions. I am so grateful to be using the highest quality ingredients in our products. Our products would not be as effective if we didn’t use the highest quality and organic or wild crafted ingredients. Spynga: What do you advise people consider when choosing their skincare products? Julie: Ingredients are so important. I have seen the amazing effects of clean and green skincare firsthand. I was blown away when I switched and I never went back! It’s also important to learn about the brand, the founder, their story & why they are selling products. Spynga: What skin care tips should everyone follow? Julie: Cleanse every day, exfoliate every 3 days and HYDRATE daily (twice ideally), and drink lots of water. Spynga: What’s a skin care mistakes that you often see? Julie: Picking pimples. Please don’t pick your pimples. Spynga: What’s your favorite Province Apothecary product and why? Julie: I have several favorite products. For my face, I can’t live without our Rejuvenating + Hydrating Face serum. I apply it twice a day. As the season changes or if my skin is feeling slightly dry, I am reaching for our Protecting Face balm, to hydrate and calm my skin during the fluctuating weather. I carry our Hydrating Rescue Balm everywhere I go. I probably apply it to my hands 10 times per day. It is a skin saver. Spynga: As we move into fall and winter how should our skincare regimens change? Julie: As the season changes, I add more hydration into my routine and incorporate our Natural Facelift Ritual (massage) into my daily practice more often. Every night I cleanse, tone and apply our Rejuvenating + Hydrating Face Serum and in the Fall/Spring, I layer with the moisturizer. In the winter, I layer with our Face Balm. In the morning I tone, apply face serum and then follow with extra hydration, depending on the season. Spynga: What’s the best beauty tip you learned growing up? Spynga: What is your favorite Province Apothecary treatment? Julie: I LOVE facials! I try and get one monthly. It’s the most amazing way to relax and hydrate, tone and activate cellular activity in your skin! My face glows for days afterwards and feels so soft and plump! Spynga: Your ingredients are all sourced in Canada, why was that important to you? Julie: I love using Canadian grown ingredients! I love supporting our local farmers and other small businesses like mine. When I started I was interested in using ingredients that were local and have been used for millennia here. I like to eat local and seasonally and I wanted this to be translated into skincare. Spynga: In addition to being organic your products are also vegan and cruelty-free as well as being Green Business Certified, why was that important to you? Julie: The environment is a priority in everything we do at PA, this is why it was so important to become a Green Certified Business. Spynga: Your products are made in small batches; would you explain what that is and why it’s important? Julie: We want to give you the best quality, most effective and freshest products! Making all of our products in small batches ensures you are getting the very best. Spynga: We love that aromatherapy is part of Province Apothecary, why was that important to you to include? Julie: As an aromatherapist, this is my backbone. Plant medicine is so amazing. Essential oils are so powerful and effective in skin care and on your whole body. Spynga: Province Apothecary offers naturopathic consolations; can you discuss how overall health affects our skin? Julie: I like to say that we (PA Holistic Aestheticians) work on the outside of the body to heal, stimulate, repair and strengthen the skin. When you combine our expertise with healing and balancing the inside of your body, you will see results faster and your skin will clear up faster (in regards to acne and eczema). We also offer Facial Acupuncture through our ND, and it’s amazing! It’s a safe and natural way to effectively improve skin tone, elasticity, reduce the appearance of fine lines and improve complexion without the chemicals. Spynga: Province Apothecary offers private workshops, please tell us a little about that. Julie: I offer lots of customized workshops. Two of our most popular workshops are our Skincare Master Class and Art of Perfuming. In our Master Classes, I teach you the secrets to using all of our products. In the Art of Perfuming, you learn how to blend essential oils into a beautiful and unique scent that is perfect for just you. Spynga: On September 19th is the webinar with Dr. Marnie Luck discussing female hormonal imbalances. Why is this an important topic? Julie: I am really looking forward to this talk! Hormonal imbalance is important to discuss because it can cause a lot of side effects in the body, like acne. We see so many clients at our skin care clinic and in store that suffer from acne or other skin issues. I am always looking to empower our clients and customers with information and education to help them on their healing journey. Spynga: How can we all take better care of our environment? Julie: We can all make a difference and take better care of the environment every day! A few things I love doing are: recycling, composting, bring my own bags to the grocery store, biking around the city, using a water bottle and a travel mug. To learn more about Julie and Province Apothecary click here or drop by the Spynga studio and try them out. This entry was posted in healthy living and tagged healthy living toronto. Bookmark the permalink.